“Startup Weekend” is coming to McKinstry Innovation Center Nov 15-17 | LaunchPad INW. Check out LaunchPad INW – the original, local social networking (and in person networking) group has transitioned to a weekly newsletter sharing information on local innovation and entrepreneurship activities. To learn more, read “Welcome to LaunchPad“. Independent online resources where you can monitor the long term trends yourself. They have the data used in the charts on this web site, and often have the same charts too. This blog has brought up nothing new – everyone else knows what is going on! www.spokanetrends.org – Community Indicators of Spokane, operated by Institute for Public Policy and Economic Analysis in the College of Business and Public Administration at EWU. This is a 5-star site with loads of data, charts, data you can download and useful interpretation of the data. They have done a superb, outstanding, excellent job here. If you only follow one web site, follow this one! Washington Rgional Economic Analysis Project. Another 5-star site with loads of data. IndicatorsNorthwest.org – Great site with data and charts. WorkforceExplorer.com. Operated by the Washington State Employment Security Department. Loads of data on employment, jobs and economic conditions throughout the state. Easy to use once you get the hang of it; another 5-star site. Far better real world data than anything you will ever see in the local media. SpokaneAirports.net. The data is not presented in a useful, downloadable format, but they do provide contemporary passenger and cargo data on their web site (2-stars). They do not provide a useful history, however. I may post the data on this web site in case anyone else wants to waste their time with this. Spokane area home sales from Trulia.com. Census Data and the CensusScope.org web site. United States Bureau of Labor Statistics. More links on the right side of this page. Take a look what happens when you rcity has a real newspaper – charts! Thank you for your interest and visits to the blog. Due to a recent Court ruling in Oregon, I may take this entire web site offline in the future. If the government provides more First Amendment protections to “journalists” than to citizens and the government decides who is a journalist, then what happens to the First Amendment freedom of the press concept? Basically, the First Amendment is thrown away as the government selectively choose who is a journalist and who is not. We wish it were true! But back in the reality-based world and this last post on this blog … by the numbers, Spokane is not getting better, it continues its long downward slide. For decades, wages in Spokane have grown at half the rate of the rest of the state, falling further behind every year. Spokane wages average about 20% behind the rest of the state. Government and health care workers make close to King County wages – but everyone else here earns much less than the -20% wage differential implies. Every year, Spokane residents fall further and further behind their counterparts in the rest of Washington and in the nation. This chart shows that Spokane per capita income was at 90% of the State’s level in the 1970s, but has declined to less than 80% of the State’s level by 2008 (the orange line). In 2010, average wages rose 2.7% nationwide, but rose only 2.3% in Spokane County. Stated another way, average wages rose 17% faster everywhere else while and Spokane residents’ income fell relative to everyone else. The next chart highlights the wage differential for those working in higher skilled jobs in Spokane. 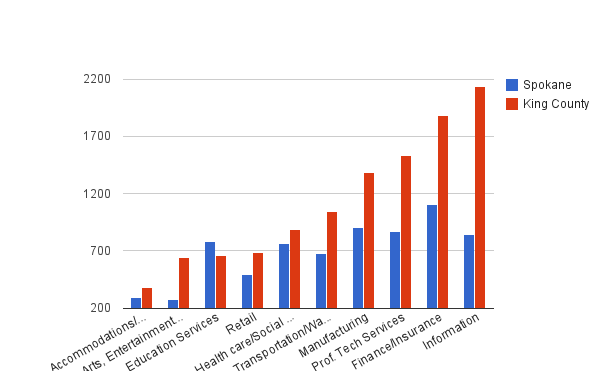 Education and health care, which are shown, are similar to King County. (Government wage data was not available for this specific comparison). As we move to the right into higher skilled jobs like manufacturing, finance and engineering, the wage differentials are enormous. Spokane will never attract a national or world class high skilled workforce when wages in Spokane are up to 50% less than across the state. Which is why the State and local power brokers have identified Spokane as the low wage, low skilled industry cluster for the state.